A helical gear drive is an improvement over straight cut spur gear because the number of teeth meshing together is increased providing more averaging of the gear errors. 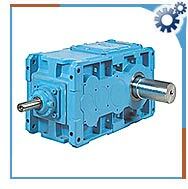 This is a drive with the steel helical gears close coupled to the fold rolls providing solid reliability. A positive gear drive assures no slippage between fold rolls for more consistent folds. Helical gear drive can be single or double. In a single gear drive each shaft is always against the thrust bearings. The external axial thrust that acts on the gear shaft under load due to the friction in the tooth coupling, cannot cause momentary overloading of one helix as is the case with double helical gears. An external thrust can have some detrimental effects on a double helical gear in connection with axial compensating shift due to tooth errors. Additional sliding in the gear mesh requires additional lubrication and is less efficient. These are compact, heavy-duty gear drives. They offer simple maintenance and provide consistently reliable operation. They offer multiple speed range. Helical gear drives are used in some of the most demanding applications and environments across a wide range of industries. They are widely used in material handling conveyors, pumps and pumping equipment, mixers and agitators, packaging machinery, and specialty machinery. Crossed helical drives are used for agriculture applications. They are also used in aircraft industry, elevators and building systems. A helical drive in brush provides uniform power transmission and added safety in tough cleaning situations.